I don’t normally blog about collected editions (trade paperbacks), but in this case I’ll make an exception. Out now from Panini is the collected Dragon’s Claws, featuring the entire (10-issue) run from 1988/89 of what was Marvel UK’s first U.S. format comic book series. Dragon’s Claws, written by me with art by Geoff Senior, charts the misadventures (in the dystopian future of 8162) of Dragon and his team (Mercy, Digit, Steel and Scavenger), former ‘Game’ (think, Rollerball but played out across entire continents) players thrust unwillingly into the role of government enforcers in a lawless, violent society. 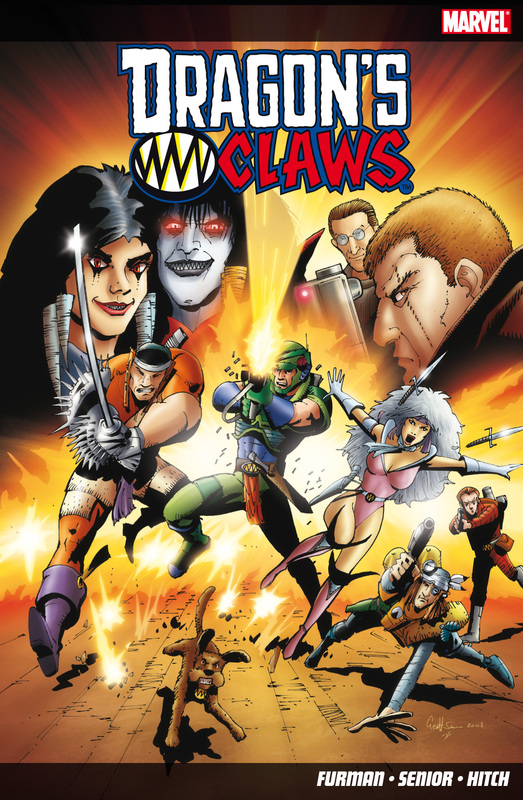 Though not my first comics work by any means, Dragon’s Claws was my first U.S. style series and my first stab at creating an entire world and cast of characters, and still—while a little raw and rough around the edges—I think holds up pretty well today. The collection also includes the Death’s Head (#2) issue featuring Dragon’s Claws and a new/revised full colour version of the Dragon’s Claws 1-page story/epilogue that artist Paul Ridgon and I put together for the Just One Page charity comic a few years back. Plus a new intro by me, an afterword by Lying in the Gutters’ Rich Johnson, new art pieces by Simon Williams and Paul Ridgon, character profiles, rare poster art and a brand spanking new cover by Geoff (click on the thumbnail below). It’s a chunky 182 pages of British comics history. Go on… treat yourself! SAY YOU WANT A REVOLUTION! Coming this December from Dynamite Entertainment, issue #1 of an all-new (5-issue) Terminator series — Terminator: Revolution. 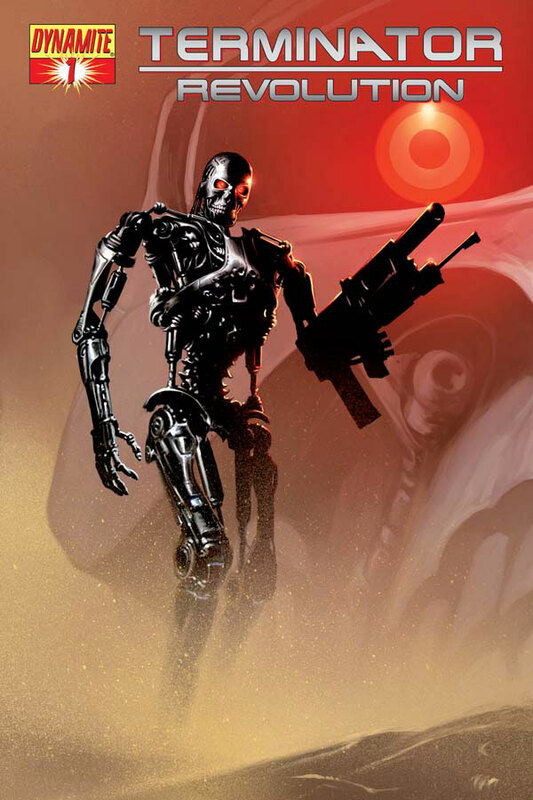 The story, which picks up on characters/situations from my previous Terminator series, Terminator: Infinity (now out in handy trade paperback collected edition), kicks of in the year 2015, as John Connor spearheads the fightback against Skynet and the machines in the post-Judgment Day world. But, of course, this being Terminator, we’re not just confined to one era, oh no. The action jumps from 2015 to 2033 to 1996, and involves John, Tara (Connor), Sarah Connor, John, Kyle and a whole skid load of Terminators: the T-Infinity (from Terminator: Infinity), the Dire Wolf (a whole new kind of Terminator) and no less than eight T-850s on the loose in Earth’s past. Art for the series is by Lui Antonio, and check out Richard Isanove’s cover to #1 by clicking on the thumbnail (below). If you want more, check out these interviews here and here. Out today (October 23rd) is the first issue of the UK’s very own Transformers Animated comic. Each issue features an all-new 11-page comic strip created exclusively for the UK, the first of which introduces an all-new Autobot character, one who’ll make a big impact on TFA universe as the story unfolds. The first story, ‘Burnout’, is written by me and drawn by John McCrea, with colour by Kat Nicholson. What else? Well, lots! More comic adventures with the adaptation of the TV episode ‘Blast From the Past’ (introducing the TFA Dinobots! ), puzzles, features, part 2 of the ‘Many Faces of Optimus Prime’ poster/feature (part 1’s in Transformers #17, also on sale now) competitions much, much more. Oh, and a FREE wrist-mounted missile blaster. Everyone should have one! 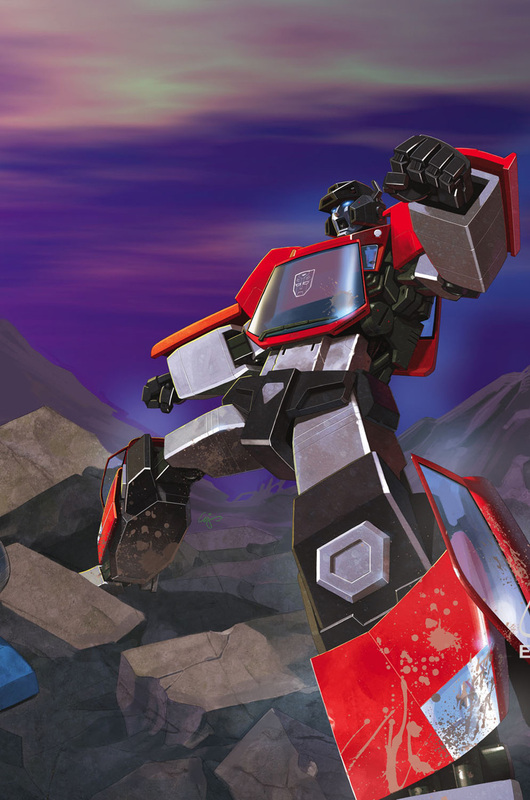 For more news and updates on Transformers Animated and Transformers (UK), check out the Titan website here. It’s the turn of Maximum Dinobots #3 for the script analysis treatment, and as always what follows boils down to teasers rather than outright spoilers, but if you’d simply rather know nothing, look away now! Okay, the poor old town of Fallon, Nevada, which has already suffered all manner of rampaging destructiveness and other sundry indignities in issues #1 & 2, gets another mauling this issue when—in addition to brawling, embittered Dynobots—Scorponok’s Headmasters get well and truly stuck in! As Scorponok’s grand, labyrinthine plan finally unfolds, poor old Skywatch (the human organization tasked with policing the skies against alien threats, in particular giant warring robots) are still struggling to catch up, pulled this way and that by the Machination. But Skywatch Chief of Operations Joshua Red has had enough, and makes some seriously major rearguard moves that will have implications not just on this series but on the IDW/TF-verse in general (for some considerable time to come). And things still aren’t looking good for poor old Hot Rod, who’s got a ringside seat (uncomfortably close, you might say) for Scorponok’s show. Is help at hand or is all hope gone? By the time you get to the end of this issue you may well be leaning towards the latter! Maximum Dinobots #3 ships in February 09, story by me, art by Nick Roche (#1 is looking SO good!) and colours by Josh Burcham (#1 is… looking even better!!). Miss it, and it’ll be poor old YOU! For news and updates on all IDW’s Transformers comic check out their site here. 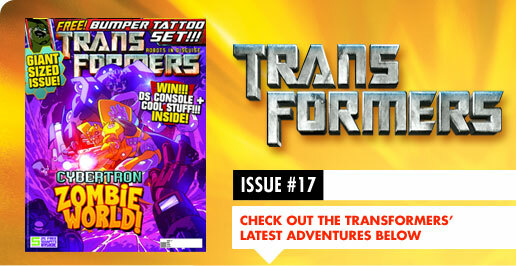 More Transformers goodness hits this week in the shape of Transformers (UK) comic/magazine #17, a packed, oversized issue featuring not but two new/UK-exclusive Transformers stories! The first of these is set firmly in the new movie-verse, or at least the alternate one established by events in the epic ‘Twilight’s Last Gleaming.’ Get ready now for an all-new multi-part epic in the shape of ‘Return to Cybertron,’ a positively world-shattering tale that takes the Autobots back to their homeworld (not the nicest of places to be currently) and into one of their biggest and most fraught battles. You really won’t believe where we’re going with this one! Featuring a whole host of new characters making their strip debut, at least this side of the Atlantic, ‘Return to Cybertron pt1’ is simply not to be missed. Story is by me, art by Jon Davis-Hunt. And as if wasn’t reason enough to pick up TF-UK #17, it comes with a bonus 5-page Transformers Animated story, featuring the Dinobots! Also written by me. All cunningly designed to make the upcoming Transformers Animated comic/magazine (out on Oct 23rd) still more desirable. And of course there’s more comic strip, more features, more letters and a fantastic free bumper tattoo set. TF-UK #17 is on sale Thursday 9th October. Oops, another long absence from my blog. Will tell you what’s been monopolizing my time — soon. Anyhow, out this week (Wednesday 8th in the US, Thursday 9th in the UK) is Transformers Spotlight: Sideswipe, the final part of the epic, if slightly squeezed, Revelation saga. And what a lot we, that is myself and artist EJ Su, packed in! The return of Bludgeon, Autobot Pretenders, more Arcee, all-out battles on three fronts, Nemesis Prime versus Optimus Prime, oh and Sideswipe! Yeah, he gets a bit of love too, seeing as how it is his Spotlight. As some of you will know, if you’ve been following this series and that, Sideswipe is kind of hung up about getting to Earth and getting to the bottom of the mystery of Sunstreaker’s disappearance. Why so concerned? Well, in the classic TF storyline, the two were ‘brothers,’ whatever that means to robots. But the new IDW-verse rarely, if ever, just parrots what’s gone before, so expect a twist to their relationship, and maybe not the ending a lot of you were expecting. Anyhow, apart from all the story goodness crammed in to the 22-pages, there’s also EJ’s positively succulent fully painted art to pore over. It’s a Transformers experience quite unlike any other — don’t miss it! Click on the thumbnail below for a peek at EJ’s cover for the issue and check out IDW’s site for news all on things Transformers. You are currently browsing the simon furman blog archives for October, 2008.